Volunteers are trained to meet all kinds of needs by providing food, shelter, clothing and emotional and spiritual comfort to those affected by the disaster. Mobile feeding units are a welcomed sight to emergency responders and victims alike providing them with hot and cold drinks, meals and essential needs. These are just one of the many services The Salvation Army provides to those in need during times of disaster. 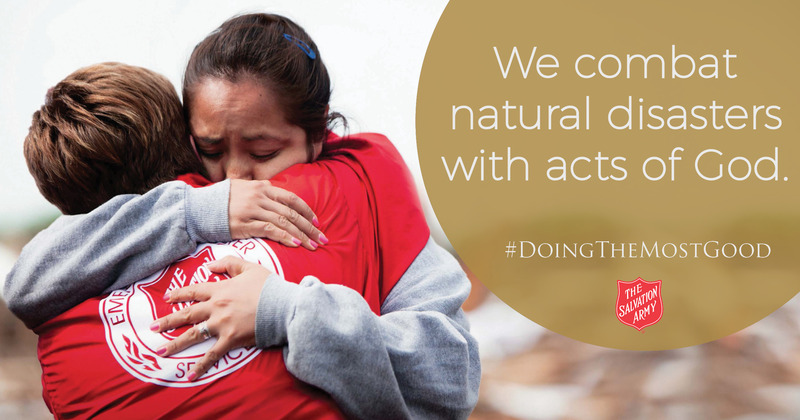 The Salvation Army’s capacity to effectively respond when a disaster strikes always begins with our dedicated volunteers. Volunteers are involved on all levels of incident command structure and disaster response including mobile feeding unit workers and drivers, administrative help, dispatch, emotional and spiritual care workers and many more.